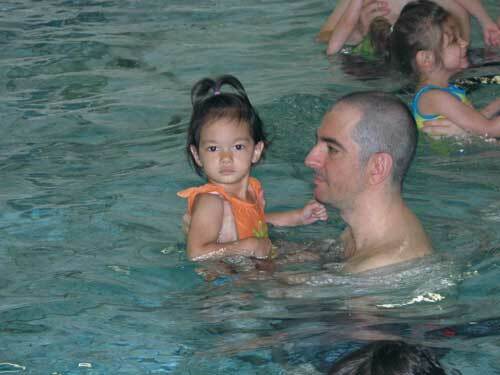 On Saturday Sienna had her first swim class (we missed the first one last week) and she loved it! She was a little apprehensive at first but then really got into and probably could have stayed longer than the half hour class. I took like 8 videos on my camera and filled up my memory card! I haven’t done that in awhile. I thought the class was just going to be them hanging around in the pool but they are actually teaching things like kicking and putting your face in the water. I need a class like that! The teacher was really good and really enjoyed being with the children. I wonder if she teaches adults? HA! Please leave a comment or e-mail me for the password! 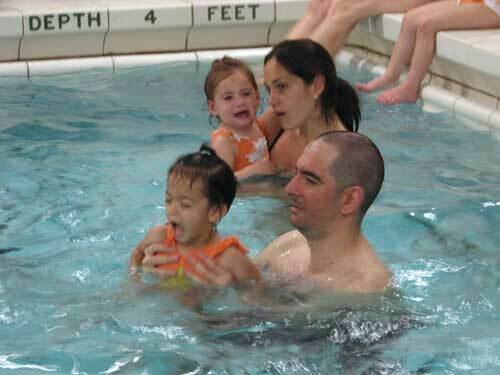 First Swim Class! from Lisa on Vimeo. Yves was exhausted after the class and we put Sienna an hour early for nap (also because we were having the first BBQ of the season later that afternoon). She slept for 3 hours and I basically ended up waking her up so who knows how long she would have slept. Too cute!! Glad she was not terrified of the water like mine were the first time. Also putting her head under and everything already, very adventurous. She’ll be swimming in no time!!! The pool will do that to you, exhaust you out completely. That class is huge so many people… wow! Love the faces they both make when it gets splashy. Bravo Sienna.. Good job. Daddy also did a good job. Seems to have been quite a workout for you both. She will be swimming in no time.